The first draft of this book was written under a tree on the slope of a sandhill where for several years, Englishwoman Pat Lowe shared a desert camp with her lifetime partner, Walmajarri man Jimmy Pike. While spending time in the red heart of country that had been the home to the Walmajarri people for thousands of years, they recorded Pikes stories through his painting and Lowes writing. 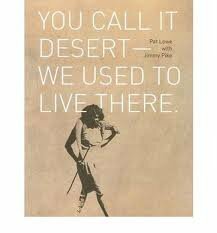 'You call it desert we used to live there' is a new edition of JiljiLife in the Great Sandy Desert. With Jimmy Pike as her teacher, Pat Lowe explored the day-to-day lives of the desert dwellers. Through her unique understanding of their use of the land, its features and materials, Lowe writes about the resourcefulness and ingenuity of the desert people.